Breathtaking! The mountains, the person there…great. I just think it’s a bit over sharpened. (HK) Thanks for your comment Mauricio. You might be right, it was hard to work on this image as the scan was not too good and I wanted to have the climber clear and sharp.. 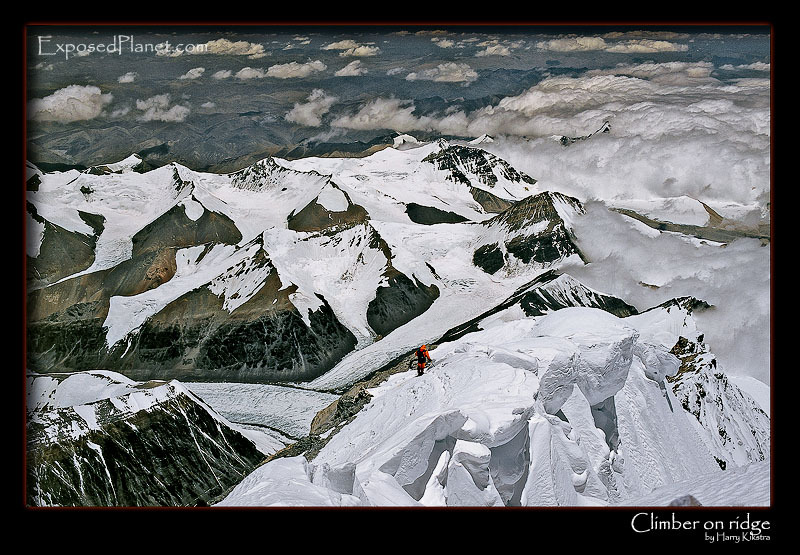 The story behind "Vitor Negrete descending on mount Everest summitridge"
Brazilian climber Vitor Negrete is descending from the summitridge of Mount Everest on June 2nd 2005, the Tibetan Plateau in the background. That year the weather was quite bad and only late in the season some climbers could summit. Also the ropes had not been fixed to the summit as is usually the case, so the last part was exhilarating and airy, as part of the route goes over the overhanging snow cornices. Though I shook his hand, I did not know his name at that time, only found out a year later in 2006 when we were having dinner together a few kilometers lower and we discovered that we had been on the summit together. Vitor climbed Everest again a few weeks after that, this time without oxygen, but died in Camp 3 on the way down. Shot with backup-body Canon 500n with 50mm lens on Provia slide film, scanned later.